I'm with Flake now, I'm handfeeding him and I will weigh daily, but he still refuse to eat, he has absolute no interest in food/water. He probably isn't going to want to eat until a day or so after he's off the antibiotics. You'll just have to force feed him, whether he likes it or not. I'll keep handfeeding him, he really don't like it but there is no other way. Also, he doesn't poop/pee, I don't see a poop for a good time, is that "normal"? He may be eating them all. Pigs sometimes do that when they're ill. But it also may be a sign of him not eating enough. How much food are you getting in him with the hand-feeding? I'm almost sure he isn't eating them. I'm managing to give 10-15cc each 2-3 hour, he's weighing 850g. That's a good amount. Consider yourself successful at hand-feeding! Thanks, my girlfriend is helping me a lot, hand-feeding requires SO MUCH patience, for us and for the pig. Try to make his food for hand feeding as tasty as you can by flavoring it with herbs or vegetable juice. It may spark his interest in eating and make feeding easier. Fresh mint, basil or parsley leaves may also interest him in eating. Thanks for the tip, I will try. Good news, Flake is now pooping! They're small but still better than nothing. 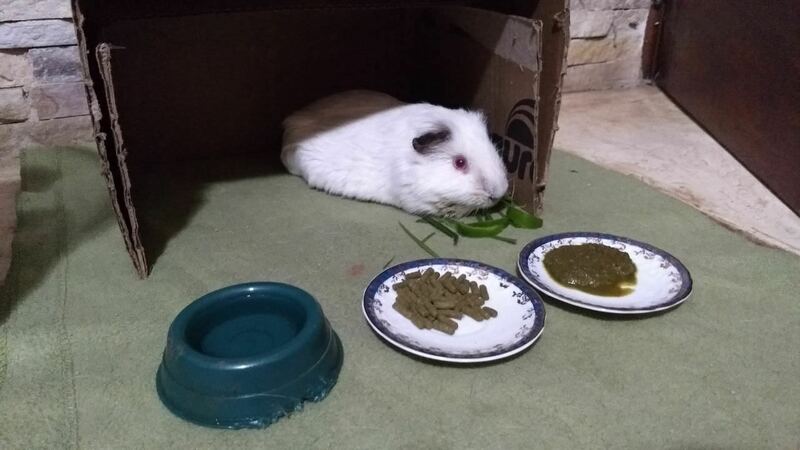 Hello, tomorrow is Flake's last day on medicine, today he tried to eat lettuce/pepper, but he bites one or two times and then gives up, is that because he still in pain? Or the teeth are too short? It really depends on how short the teeth were cut. Can he pick up the food with his incisors? FYI, it's not a bad idea at all to tell the vet not to trim the incisors. If the molars are working as they should, the incisors will be the right length. He has to be able to work the food back to his molars with his incisors. Once the food gets back there, the grinding motion in addition to the incisors keeps the food going toward the back of his mouth. In the meantime, you can cut food into matchstick portions and push them into his mouth back to his molars. If he can then chew and eat those, the incisors will eventually straighten themselves out. Did they do a skull x-ray to rule out elongated roots and/or abscessed teeth? Either of those will make a pig unwilling to chew. The only x-ray I did was the one I posted on page 1 of this thread, I'm not sure if they saw any problem with elongated roots and/or abscessed teeth, could you tell me by looking at the photo? I'm not very good at reading x-rays. It looks to me like there could possibly be elongated roots, but I'm really not sure. This night he managed to eat some lettuce, not a good amount but it's the first time he eats in like 10 days. He's on the garden now but didn't eat grass/cabbage/carrot. It is difficult to tell from your xray. I looked at the side view, which I think would show elongation the most clearly but could not tell. If you have a larger image of that one, it would be helpful. Meanwhile, there are a few dental xrays in the teeth pages you could look at (none of us are specialists).